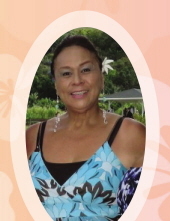 JoAnne Uluwehi Keahi, 65, of Waimanalo passed away on Wednesday, March 13, 2019 in Honolulu. She was born in Honolulu, HI. She is survived by her husband William K. Keahi. Visitation is at 9 a.m. on Friday, April 12, 2019 at Nuuanu Memorial Park & Mortuary, services at 10 a.m. Burial at 2 p.m. at Hawaii State Veteran Cemetery. To send flowers or a remembrance gift to the family of JoAnne Uluwehi Keahi, please visit our Tribute Store. "Email Address" would like to share the life celebration of JoAnne Uluwehi Keahi. Click on the "link" to go to share a favorite memory or leave a condolence message for the family.